As the centennial of The Great War approaches, volumes of new research provide ominous warning about history’s rhymes. Yet China is not Germany. However frightening the parallels may seem, trying to meter history distracts the historical mind from proper inquiry. As the United States begins to formulate a new strategy for a post-Afghanistan era it should look back to this century-old calamity for perspicacity, not for similitude. British pre-war army reforms, implemented by Richard Burdon Haldane — Secretary of State for War (1905-1912) — and subsequently named after him, present another lesson from which strategists could analyze a familiar conundrum. Strategy is as vital in peace as it is in war, but peacetime restrains it. History provides invaluable insights into untangling this contradiction at a time of budgetary and political uncertainty. The British Army, embarrassed by its lackluster performance in South Africa (1899-1902) was in desperate need of reform. Before Haldane assumed office two government commissions called for it. As a peacetime Secretary, Haldane succeeded. He is credited with having prepared the British Army for the First World War. In hindsight, of course, nothing could ready Britain for years of trench warfare, with its gas and horror. But from August to at least that famed Christmas of 1914, British soldiers were able to deploy quickly, fight against their continental peers, and to resupply efficiently. Field Marshal Douglas Haig would later say of Haldane that he was the best Secretary the Empire ever had. As successful as Haldane was, such pronouncements teach the wrong lesson. At the onset of war, the British Expeditionary Force — established by Haldane in 1907 — “did not possess the heavy guns and howitzers, the high explosive shells, or even the machine guns of the German Army.” What caused this quagmire was the disparity between strategic planning and peacetime economic concerns. Britain’s new Continental strategy outlined the ends; peacetime prescribed the ways and the means. Haldane was aware of this paradox and hoped that “the existing forces, if better organized, would fulfill the strategic requirements.” Haldane deserves the gratitude of his nation, but it is the limitations of his reforms that require further analysis. This is a story of perhaps the most understudied pre-war cabinet minister — and his reforms. The British Empire was built without a grand strategy. As William Manchester captured 31 years ago, its growth was “a formless, piecemeal advance which leapfrogged across continents and was never static.” Adding, crucially, that even the unity of the Empire was a fiction. Each colony had its own rules, languages, and customs. Britain’s 19th century was punctuated by Napoleonic and Crimean Wars and narrated by Great Game intrigues with Russia. Britain emerged prosperous from it all. The second industrial revolution was unraveling, trains steamed through continents and ships sped at unprecedented speeds; communication lines stretched from London to Calcutta. Britain considered itself at peace. One of which against the Boers in the Transvaal and Orange Free State — The South African War — was its last before the outbreak of World War I and its most memorable. During the first year of hostilities, British troops took heavy casualties and lost ground to a successful guerrilla campaign. In December 1899, over the course of one week, almost three thousand British troops — heavy casualties for a Colonial war — were killed in the battles of Colenso, Magersfontein, and Stormberg. From 1900 to 1902, the British Army turned the tide. But only after it implemented a series of harsh tactics. A scorched earth policy was adopted, leaving the Boers with nothing to return to or defend. Prisoners of war were sent overseas. Women and children in captured territories were interned in camps. The war was immensely unpopular in London. The victory in South Africa raised many questions about the future of the Army, which performed abysmally. It was mismanaged, unorganized, failed to act timely on intelligence, lacked adequate training, was not prepared logistically, and relied on sub-standard equipment. Two government reports commissioned after the war were right to call for major reform. But the South African War caused another pivotal stir, carrying already contentious Anglo-German relations into the 20th century. Transvaal, the independent Boer republic Britain fought to annex, was heavily populated by German settlers many of whom were prominent gold miners. Berlin sought to finance a railway to link the landlocked Transvaal wealth to the Delagoa Bay in Mozambique. Britain opposed on grounds that this would dilute its “political and economic dominance in the region.” This rather trivial incident in either country’s history raised enough tension that Sir Edward Malet, British ambassador to Berlin, hinted at the possibility of war. When Britain opened hostilities against the Boers in 1899 Germany opposed. Germans were outraged that their government “refused to interfere” and the press, which actively preached imperial self-reliance (expansion) for Berlin, protested. Of course, the Kaiser didn't refuse to interfere, he simply could not. Germany’s Kaiser Wilhelm II, an avid reader of American Admiral Alfred Mahan, was convinced that a “struggle for global power would be decided by vast fleets of heavy battleships and cruisers.” A thesis Mahan outlined in 1890. For him, the South African War reinforced this belief. Britain’s ground war of choice on the far reaches of Empire, thus added an additional log to a mounting continental bonfire. The Kaiser stuck to his principles and picked Admiral Alfred von Tirpitz — a cheerleader for a grand navy of battleships designed to challenge Great Britain — to lead a long term naval construction program. The arms race began, but it was limited. No nation wanted the fight. Most were belligerent toward each other, but only in words. The next decade of decisive geopolitical realignment was driven by personalities and diplomatic maneuvering. Continental Armies were vast — dwarfing England’s — and Germany was confident in its own. British Naval dominance surely upset Germany as it challenged its imperial ambitions, but it didn't consider England a threat. Certainly not an existential one. In fact, Bismarck famously remarked that if the British Army were to show up in Germany he would simply have it arrested. This attitude was reciprocated. Sir Francis Bertie, assistant under-secretary at the British Foreign Office, said that “should it come to a war… the annihilation of German commerce on the high seas would be child’s play for the English fleet.” The Kaiser himself was no stranger to controversy. At dinner with King Leopold of Belgium, he once casually offered Belgium French territories should it side with Germany in an event of war. Leopold was so taken aback that “he put his helmet on the wrong way round” before leaving the table. In hindsight this seems alarming. But upon closer review of the Kaiser’s correspondence, it simply suggests an activist monarch trying to play foreign policy. Some of his plans, such as stationing a Prussian army corps in California, a proposal he made seriously to President Roosevelt — underscore this lack of mature leadership. Tsar Nicholas II tried to stay actively involved in the making of policy, but he lacked executive support or expertise in foreign affairs. His teenage tutor remarked how “Nicky” spent most of his time picking his nose, not learning. But the Tsar had friends, especially merchants from the East that wanted to expand Russia’s reach in the Pacific. Nicholas succumbed to pressure and appointed his own man, Amiral E. I. Alekseev, as Viceroy of the Far East. Alekseev had similar foreign policy credentials to the Tsar. His lack of experience and Nicholas’ obsessions with eastward expansion culminated in the Russo-Japanese war. The war cost Russia two of its three fleets. It also rallied Russian ministers to wrestle control away from the monarch. They reverted Russia’s policy to the west, eased tensions with Britain, and normalized relations with Germany. However, by 1911 one leading minister was killed, others were ousted. Russia’s government was divided for several years preceding the war. Treaties signed in the first decade of the 20th century, which have long been regarded as the causes of war, have also recently been reexamined. After all, the Entente Cordiale (1904) exchanged “British dominance in Egypt for French dominance in Morocco.” It was not an anti-German pact, even though France did give priority to the defensive posture of the treaty. Russian troops taking Samarkand 1888. Since Catherine the Great, Imperial Russia conquered vast swaths of Central Asia in its march to challenge British dominance over India. This Great Game between the two Empires continued until Japan defeated Russia in 1905 leaving it weakened. An endless list of political and strategic misses and perhaps more importantly personal animosities eventually drove Europe to war. In these tangled times, Germany pushed actively for its “place in the sun.” Economic performance backed this thrust. From 1860 to 1913, German “share of world industrial production increased fourfold, while the British sank by a third.” Europe, at the start of the 20th century, was a zero sum continent. From the start of British woes in South Africa to the imperial machinations of the Kaiser and through the malaise of European diplomacy, Viscount Richard Burdon Haldane was there. At first as an involved observer, then as Secretary of State for War. To accomplish his task of Army reform at a time of rapid change and geopolitical uncertainty, Haldane relied on core peacetime principles: economic (keeping budgets constrained) and political (maintaining Imperial responsibilities). Britain’s new Continental strategy did provide a “focal point for reform” highlighting, for example, the need for mobilization. But it was limited. Haldane, a lawyer by training, argued before the House of Lords prior to becoming an influential politician. In 1894, he represented the Nobel Explosives company in its case against the Government Ordnance Factories. Alfred Nobel, the company’s founder and inventor of dynamite, accused the British government of patent infringement. He claimed the military’s use of cordite to tame nitroglycerin for firepower had violated his intellectual property. Nobel lost the case on a chemical technicality, but not before making Haldane an expert on both dynamite and its military applications. The case began Haldane’s transformation from an advocate for education reform to the future cabinet minister in charge of the War Office. The first few months of the South African War had revealed that the British Army “had succumbed to amateurism with inadequate tactics and outmoded strategies.” It also lacked proper equipment; British propellants were “ruining the army rifles.” In 1899, while traveling back from Somerset, Haldane rode with Lord Lansdowne, then Secretary for War. Armed with knowledge from the Nobel case, Haldane impressed Lansdowne with his analysis of the gunpowder issues plaguing soldiers in Transvaal. The Secretary asked Haldane to join a parliamentary committee to review the matter. Haldane was enthused. Over the years, Haldane proved to be an able negotiator and an effective Member of Parliament. He was also a close friend of Herbert Asquith and Edward Grey, the former became Prime Minister in 1908 and the latter Secretary of State for Foreign Affairs in 1905. Both occupied other illustrious cabinet positions throughout their tenure. As did Haldane. Politically, the trio helped each other build consensus and gain influence. Before practicing law, Haldane studied German philosophy and used this analytical training to his advantage. Henry Campbell-Bannerman, Prime Minister from 1905-1908 and himself a former Secretary for War, disliked Haldane and was weary of his “reputation as a philosopher.” He did, however, acknowledge Haldane’s newly formed military interest and at the urging of Asquith and Grey brought him into the cabinet as Secretary of State for War. Haldane didn't expect the post, but he was ready for it. Five years prior, in 1900, he publicly “condemned the government for its lack of military preparations, for entering the war [in South Africa] without sufficient men, horses and guns.” Haldane did not seek a career boost from this assignment. He wanted to save the Army from future embarrassment. Unlike his predecessors, Haldane did not start with an agenda. He “tried to first ascertain what was wrong by enquiry from those who were qualified to enlighten him.” Haldane immersed in the study of military history and surrounded himself with capable advisors. To the surprise of Campbell-Bannerman, Haldane’s inclusion of military experts in his decision-making process warmed senior officers to his reforms and helped him be successful. Haldane frequently joked about putting up a sign over the War Office that read: “Thinking Costs Nothing.” He encouraged everyone in his Office to spend more time exercising this freedom. Spenser Wilkinson, a prominent professor of military history, proposed creating a British General Staff — based on the German model — in 1890. The idea was considered, but until a Royal Commission “revealed a lack of strategic planning, a woeful shortage of maps, and the use of hopelessly inadequate tactics” in South Africa, it did not stick. Haldane’s predecessor in the War Office tried to implement a General Staff but parliamentary disputes prevented progress. Upon assuming office, Haldane took the advice of Lord Esher, author of the Royal Commission, who pleaded with him about the importance of such a General Staff and stated that its absence “has, for many years, been a primary cause of inefficiency throughout the Army and a serious obstacle to well-ordered progress.” When Haldane introduced his first proposals he avoided the example of Germany — a rising foe — and instead cited how “the Japanese army derived a profound advantage in Manchuria from the possession of a General Staff.” England should have one too. From the day Haldane walked into the War Office — exhausted by that day’s heavy smog — to the day he left, he faced challenges “on every conceivable front.” His task was to reform the Army, an institution of war, at a time of peace. In the process, his own Liberal cabinet demanded military spending to be curtailed. His predecessor, Hugh Oakeley Arnold-Forster, began to take steps toward reform based on recommendations of the South African War commissions. He helped establish a Committee of Imperial Defense (CID) in May 1904. The CID created a new sandbox for the War Office and the Admiralty to fight in. Primarily they scuffled over the responsibility for defending the homeland, a pretext to justify their force size and budget estimates. The Admiralty nearly always won. As an island nation and a benefactor of a global Empire, England needed its sea power first. This was taken to a new extreme after the Kaiser announced his ambitious shipbuilding plan, which “was designed for aggressive and offensive action of the largest possible character in the North Sea or the North Atlantic.” Since 1889, London was committed to a two-power standard — its Navy had to “be as great as any two other navies combined.” With German plans to deepen and widen the Kiel Canal — making the passage for its Dreadnoughts into the North Sea shorter by 1915 — the Admiralty was rightfully worried. SMS Breslau, a Magdeburg-class cruiser passing in the Kiel Canal, which connected the Baltic Sea with the North Sea. This environment created a government that funded the Navy, but demanded Army reforms. This is exactly what Haldane wanted. Campbell-Bannerman, Prime Minister the first two years of Haldane’s tenure as Secretary, declared “against a policy of British aggression and overseas adventure.” He led his Liberal party against the budgetary excesses of the previous Unionist government, which due to the South African War increased Army Estimates 64 percent from 1896 to 1905. Haldane had a “distaste for extravagant military expenditure.” He blamed the Unionist government for wasting money, citing that although budgets have increased over the past 10 years driven by spending for the South African War, the Army had not improved. After the war, in a time of peace, Haldane charged that the Army continued to live beyond its means. He told his audience sarcastically that seemingly “peace hath her budgets no less renowned than war.” He was going to change this. As noted earlier, Haldane surrounded himself with able advisors. Charles Harris, Permanent Head of the Financial Department, was one such consultant. Harris was convinced “that there was waste at every turn of the [Army] organization.” And there was. Within weeks of taking office, Haldane and his team proposed an Army estimate of £28 million, a six percent reduction from previous estimates. His proposals were approved by a landslide vote. The immediate savings may seem minimal, but they achieved two objectives. First, annual increases in spending stopped. Haldane would hold this ceiling throughout his tenure. Second, he ensured that “future army reforms would be based entirely upon existing resources,” forcing efficiency. Haldane established a financial limit to his Army Estimates and set the tone for his biggest challenge: reform — or perhaps better said — reorganization of the Army. Haldane appointed Colonel Gerald Ellison based on Lord Esher’s recommendation as his military secretary. The two made a dynamic and intellectually charged team. Haldane “had to assimilate a mass of new information before he could even consider reform.” He admitted to Ellison that he “knew nothing about the elements of military organization.” Haldane came to rely on Ellison for his encyclopedic knowledge. The two spent entire weeks away from London in Cloan, Haldane’s family home, reading Clausewitz, Goltz, Picq, and Schellendorff among others and being engaged in spirited debate. The Army Haldane inherited had a wide array of responsibilities. Its prime task was to provide effective support of the civil power in all parts of the United Kingdom and after the provision of reliefs for India and the garrisoning of fortresses at home and abroad, it had to be able to mobilize rapidly for home defense two Army Corps of Regular troops, and one partly composed of Regulars and partly Militia. …highly organized and well equipped striking force which can be transported, with the least possible delay to any part of the world where it is required… Behind it must be a sufficient supply of troops to maintain it undiminished in numbers and efficiency and home defense must be adequately provided for… The schemes which will form the basis of their organization in peace, and of their allotment in wars, will be prepared by the General Staff. To create such a force, Haldane knew that he would need large reserves. Over the next several years, he would transform the British Militia, Yeomanry, and Volunteer forces. Shortly after taking office Edward Grey informed Haldane of the “rift in Franco-German relations over the Moroccan crisis.” Grey believed that Germany may invade France in the Spring of 1906. Grey told Haldane that the British Army may be asked to help France and if so, what “could he offer?” Haldane charged his first Chief of the newly minted General Staff, General Neville Lyttelton to investigate the Army’s mobilization potential and to start a dialogue with his counterparts in France. Lyttelton informed Haldane that only 80 thousand troops could be mobilized and slowly. This would not be sufficient. Britain now had a Continental strategy. It was a departure from Britain’s Colonial focus, but for the Army it was a “consummation of a trend away from home defense.” The Admiralty had this task. Haldane, albeit limited by peacetime budgets and recruits, would use this new focus to organize the Expeditionary Force. He managed to use the argument of Colonial defense — even after Japan defeated Russia, reducing the threat to India — to justify an Expeditionary Force of 160 thousand men. This was far more than Imperial needs required. It proves, along with General Staff meetings and planning sessions with France that occurred over the years — that Haldane did keep the Continent in the back of his mind. However if Continental objectives were a strategy, then Haldane would have funded, trained, manned, and armed the Expeditionary Force appropriately. His success was limited. His new force was organized for efficient overseas deployment and trained better, but the troops that arrived to Flanders were not ready for war against Germany. They had to adapt. Haldane may have understood the potential of the threat, but peacetime prevented him from taking action. Part of his efficiency drive would be to reduce the size of the overall force and to achieve the parity promised under the Victorian system. Haldane would successfully remove eight overseas battalions from garrisons abroad and three specifically from South Africa, culminating in a 74 battalion structure at home and abroad. He also constantly struggled with finding recruits. In peacetime no one wanted to serve. Haldane organized “home battalions into large divisions.” The garrisoned Army in India, prepared to fight a Russian advance, was organized into army corps and “relied upon large divisions composed of 3 brigades and battalions of 4 strong companies.” Haldane sought “common principles of organization” to avoid blunder in war “should the two armies ever be required to act together.” Haldane chose correctly. By selecting a Colonial model that by happenstance was organized to face a “Continental” Army in Asia, the Expeditionary Force was better prepared for the Deutsches Heer. Haldane was not an armchair reformer. He spent his tenure as Secretary touring the country, actively meeting with the Militia, Yeomanry, and Volunteer force leaders. He was steadfast with his reforms, but he welcomed outside opinion and consultation. He spent the next several years negotiating the creation of a new Territorial Force — the second pillar of his reformed Army. The Militia was the “oldest military force in the kingdom.” And it was archaic. It lacked a cavalry and an artillery and it was expensive to maintain. It was staffed by country gentlemen and was comprised of 85 thousand men organized into 124 battalions that were chronically understaffed. It was not liable to serve abroad. The Yeomanry fared better. It was smaller, comprised of 26 thousand troops and organized into 56 corps of mounted landowners and farmers. It trained annually, but lacked a staff or a brigade organization. The Volunteer force “completed the triad of auxiliary forces” and was at one point put together from exclusive middle class military clubs. By the time Haldane started his tenure, the Volunteers were largely comprised of artisans. …not be organized for jingo swagger; not a nation that desires fighting for fighting’s sake; not a nation that holds war lightly; but a nation that realizes the terrible nature of war, because its manhood knows what war means; a nation which is averse to strike unless the blow be called for in self-defense or in vindicating the cause of justice and of righteousness. He fell short. Opposition Unionist leadership excluded the militia from the Territorial Force, “leaving them in a special reserve to support the Expeditionary Force.” On the other hand, the Radical and Labour critics also forced Haldane to accept a diminished — home defense — role for the Territorials. Haldane was thus well aware of German ambitions, as well as Britain’s Continental strategy. His reforms, however, were limited. Haldane “provided the Army with a strategic purpose other than the defense of the homeland,” but his reforms were set against “strict financial limits” and adherence to “Imperial military requirements.” He hit major political and bureaucratic barriers that prevented him from expanding the size of the Army beyond peacetime budget requirements or the regular responsibilities of supplying drafts to Colonial garrisons. The Expeditionary Force was formed from “existing resources” and a “voluntary system of recruiting.” The financial ceiling Haldane imposed provided an impetus to rationalize resources and to organize more effectively. Haldane understood the ends of a Continental strategy — war with Germany — but peacetime guided the ways and means of his reforms. Aware of this contradiction he chose to optimize the Army to its peacetime potential, hoping that the best force today would be enough to start tomorrow. As the United States withdraws from Afghanistan it will be at peace. Terrorism will threaten security and the military will have ample international relief, clandestine, and training missions to keep it busy. But the armed forces — and more specifically the Army — will rest from war. It’s leisure, however, will be interrupted by budget cuts, military reviews, and near mandatory end strength reductions. There will be reform. Bernard Brodie, an American military strategist, echoed Haldane when in 1959 he famously wrote that “the strategy of general war” is “inevitably determined in peacetime.” Budgets — the mechanisms by which the ways and means, the force structure and materiel are determined — are a “major and omnipresent restraint.” He added that in peacetime we can never be rich enough to afford all we need, no matter the ends. Thus we must make choices. In our time of rapid change, driven by immense scientific advancement, peace may not last 12 years as it did for Britain. We should use it wisely. Haldane teaches us that in peacetime reforms should adhere to an acceptable budget. The military should improve its efficiency and professionalism. And as any organization it should change to modernize, not to correct past mistakes. Picking or even having an enemy is perhaps counterproductive. Edward Spiers, the primary reviewer of Haldane’s reforms, rightly highlighted that Haldane’s crowning achievement was to embrace the shackles of peace, when he could have drummed for war. Recently, the Chairman of the Joint Chiefs of Staff, General Martin Dempsey spoke at the National Defense University. He said: “I’m going to increase my commitment to have a conversation with our national leaders and the American people about the purpose of the military, not only in times of war but in peacetime as well.” He should not confuse purpose with strategy. Allison, Michael J. “The National Service Issue, 1899-1914.” PhD diss., King’s College, 1975. Clark, Christopher. 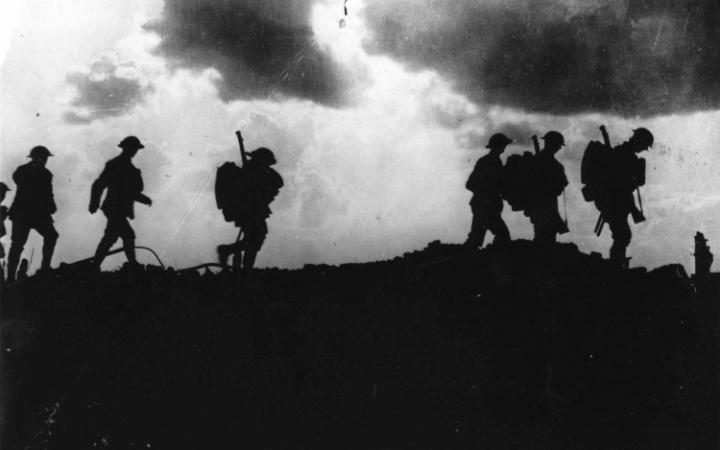 The Sleepwalkers: How Europe Went to War in 1914. New York. Harper. 2013. Haldane, Richard B. An Autobiography. London: Hodder and Stoughton. 1929. Haldane, Richard B. Before the War. London: Cassell and Company, Ltd. 1929. Higgens, Simon G. “How Was Richard Haldane Able to Reform the British Army? MPhil thesis, University of Birmingham, 2010. Spiers, Edward M. The Scottish Soldier and Empire, 1854-1902. Edinburgh University Press. 2006. Spiers, Edward M. The late Victorian army: 1868-1902. Manchester University Press. 1992. Spiers, Edward M. Haldane: An Army Reformer. Edinburgh: University of Edinburgh. 1980. Vaughan, Frederick. Viscount Haldane: ‘The Wicked Step-father of the Canadian Constitution.’ Toronto: The Osgoode Society. 2010. Manchester, William. The Last Lion: Winston Spencer Churchill Vision of Glory, 1874-1932. New York: Bantam Books. 1983.